Uglyworld #1492 - Snackies Packies (Project TW - Image 91-366), a photo by www.bazpics.com on Flickr. Before leaverings Grenobles yesterday I was smarters enough to visiters one of the cookie shoppers in the city to grabbers some of their super tastier cookies which they even makers in "snackies packies" size, which is perfects for an ugly on the moves! They is makereds from super tastiers butter and has teenies weenies littler bits of chocomalate mixereds in too! 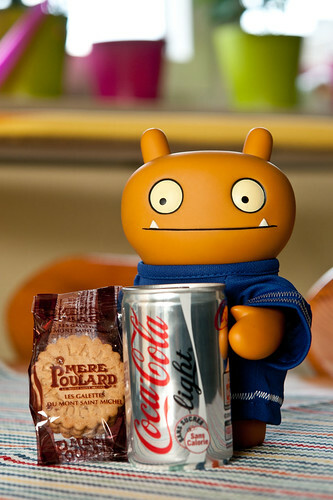 The Frenchers woman behinds the counter even givereds me a free cans of diet cokes in snackies packies size too, sometimes I is justs so luckies to gets to traveller all overs the world with Baz or I wouldn't gets to sees so many coolers places and eats so many tastiers cookies! Al I has to does now is finders a nice quieters spot heres in the cookie cave to munchers on them without alls of the others hearings me or else I will has to shares them with everyones!